On the 21st (Tue), examine the collection at Anthropological Museum and then head off the coast to Ross Island. Get ready for a full day of sightseeing on the 22nd (Wed): kick back and relax at Corbyn's Cove, appreciate the history behind Rajiv Gandhi's Statue, steep yourself in history at Cellular Jail, then examine the collection at Samudrika Marine Museum, and finally contemplate the long history of Chatham Saw Mill. To find photos, where to stay, ratings, and tourist information, you can read our Port Blair tour itinerary planner . Chennai to Port Blair is an approximately 4-hour flight. Traveling from Chennai in May, you will find days in Port Blair are a bit cooler (38°C), and nights are somewhat warmer (36°C). 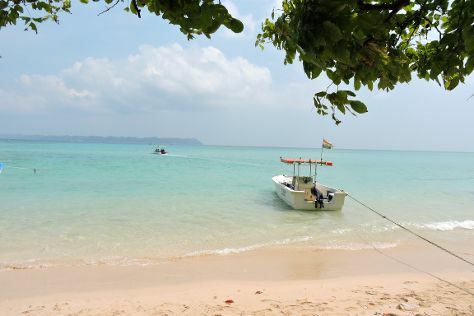 Finish up your sightseeing early on the 22nd (Wed) so you can catch the ferry to Havelock Island. Bring the kids along to Radhanagar Beach and Elephant Beach. There's lots more to do: enjoy the sand and surf at Kalapathar Beach, tour the pleasant surroundings at Govind Nagar Beach, see some colorful creatures with a scuba or snorkeling tour, and get outside with Captain Hook’s. To find other places to visit, maps, traveler tips, and tourist information, use the Havelock Island tour itinerary builder site . You can ride a ferry from Port Blair to Havelock Island in 3 hours. Finish up your sightseeing early on the 26th (Sun) so you can travel to Neil Island. On the 27th (Mon), enjoy the sand and surf at Laxmanpur Beach and then kick back and relax at Bharatpur Beach. For other places to visit, ratings, photos, and tourist information, use the Neil Island trip builder website . The Route module can help you plan travel from Havelock Island to Neil Island. Finish up your sightseeing early on the 27th (Mon) so you can travel back home.